No queues. No waiting. On-the-spot health fund claims. 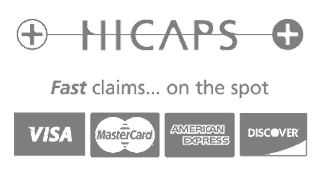 At Heidelberg Dentist, we use the latest HICAPS terminals that not only allow for contact-less Paypass / Paywave payments, but also instant processing of your claim if you are a member of a health insurance fund. This means that you only pay the gap as long as your health fund membership is active and the item numbers that you are being treated for are covered under your policy. Depending on their level of cover, HCF and CBHF health fund members may be fully covered for diagnostic and preventative dental services for the whole family. Our preferred provider status with these two private health funds allows our patients to maximise the benefits from the premiums they pay to maintain their private health insurance. You can call your health fund check the inclusions in your private health insurance policy or you can keep the mystery and find out in the clinic by swiping your health fund membership card through the HICAPS machine.